Our U18 7s team had an experience of a life time competing in the this year’s Commonwealth Youth Games held in Samoa. 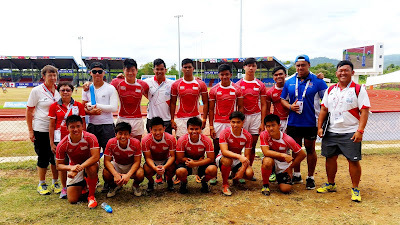 And to top things off, Singapore got the first ever win for Rugby 7s in the Commonwealth Youth Games, winning Cayman Islands 24-0 in the 7th/8th placing match 24-0, in final day the Samoa CYG Rugby 7s Men’s (U18), to put Singapore in 7th placing. The team played a total of five matches. South Africa, England, Namibia, Fiji, and Cayman Islands. With rugby 7s being an Olympic event, for the players from the dominant rugby nations, this would be a huge stepping stone for them before the Olympic games in 5 years time. And for our U18 team, a priceless experience to be competing a highest level at this age category. Well done to the team, and to everyone that made this journey possible, thank you.